Over the years I have followed several branches along the road of healing arts. Although I was an Art teacher for many years, I have always been interested in Art as therapy; a visual & expressive outlet for comfort and healing. I feel that all the paths I have chosen to walk and the ones I am still exploring, have lead me to a fusion of all my knowledge, passions and spiritual beliefs. I call this my Holistic Haven. My love of Nature flows through my essence and into my work. You will find most of my pieces based on flowers, trees, animals & dream landscapes. These days people suffer from a high level of stress through many environmental factors; the main one being that we are all detached from the primitive connection with Nature that we once had. My beautiful images uplift and give a sense of calm and peace, aiding relaxation and meditation. Art should help people to feel inspired and empowered despite life’s every day challenges. 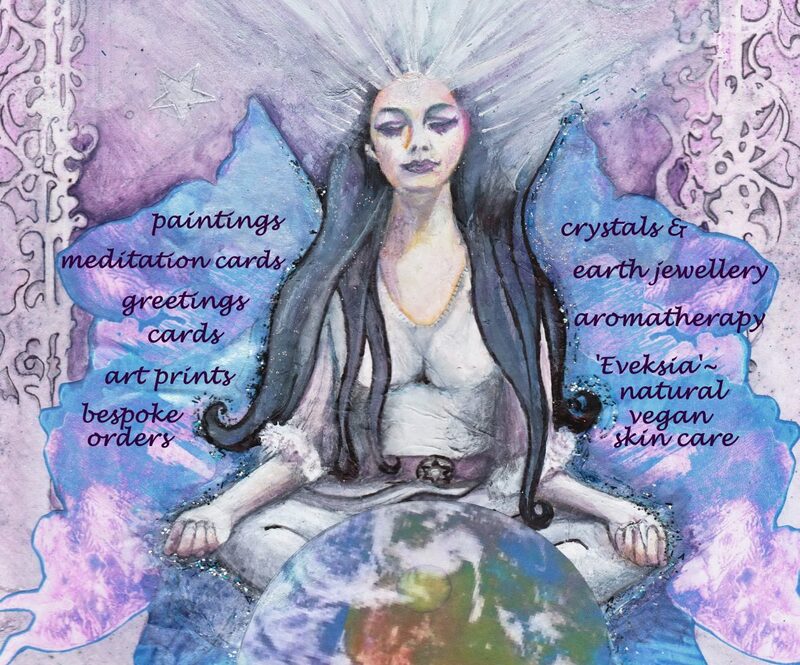 The use of COLOUR and ANCIENT SYMBOLISM is extremely empowering for psychological and emotional well~being so I take the essences of colour healing and imagery seriously when creating my pieces.I create mix media paintings, prints, greetings cards and meditation cards on which I print quotes, mantras or poems as keepsakes which can be spiritual inspirations forever. My interest in CRYSTALS inspires me to produce jewellery and adornment pieces for various emotional issues using tiny chips and polished crystals which touch the skin and work with the body’s vibrations. I am currently developing a range of organic, vegan & aromatherapeutic SKIN CARE PRODUCTS which work to enhance emotional well-being through the use of carefully selected essential oils. The simple formula enhances the natural health of the skin by containing 100% natural & organic ingredients.Finally, I am serious about my footprints on the environment so I work on environmentally friendly materials as far as possible and use recycled packaging to wrap and protect my work for shipping.